Being able to connect to potential clients quickly and effectively is a problem many business have today. 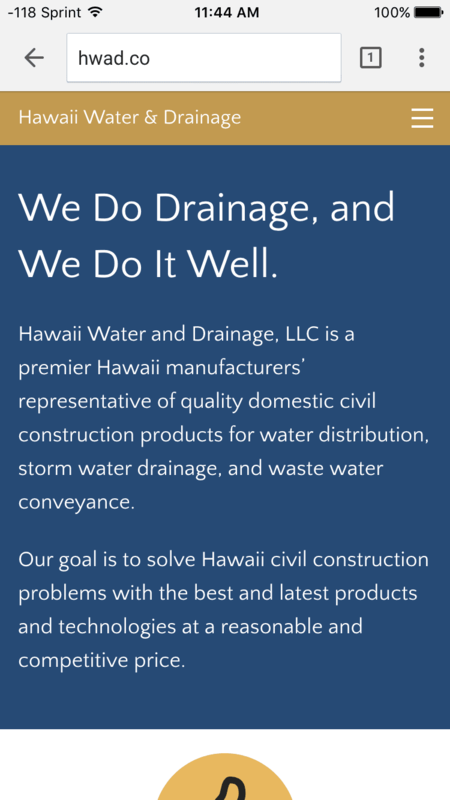 Though my work with Hawaii Water and Drainage I was able to help fix this problem. Utilizing my web design and webmaster skills I was able to put up a clean website that allowed HWAD to display their work to potential clients. Before meeting, HWAD really needed to find a way to market and showcase their projects to the digital consumer. Their great work needed a great site to show their potential clients the quality and expertise they provide. I was able to address this problem by making a site that properly describes the quality of their products and services. I took the approach of designing responsively, providing users on any device a wonderful visual experience. This allowed HWAD the opportunity to communicate with clients on multiple platforms anywhere from a smartphone to a 27” display. Today, a lot of business is happening online and companies need a stronger digital presence. After working alongside HWAD, I was able to lay the foundation and help construct a great digital presence for their company.